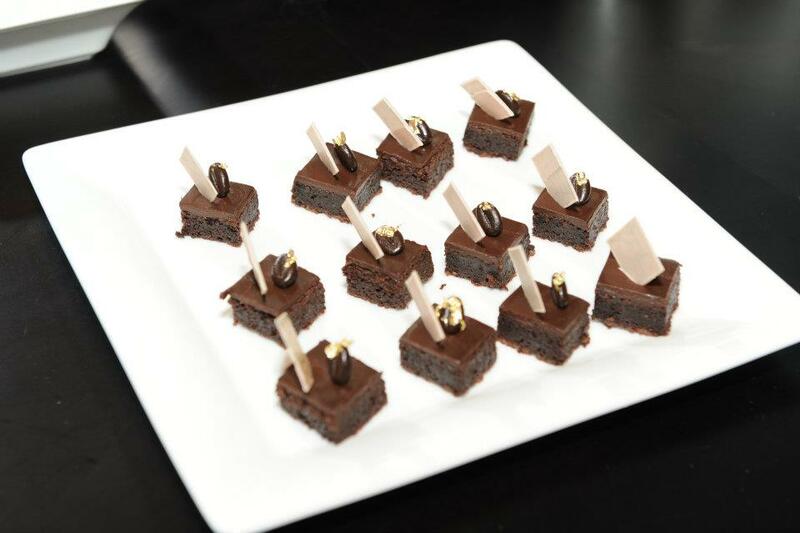 The event on 4.20 was a private gathering for fashion bloggers and fans. 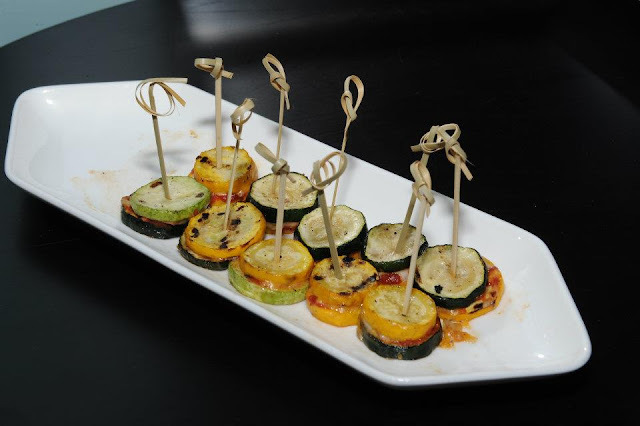 The venue of this party was the top-notch Azure Bar of LKF Hotel which is located in the heart of the central business district of Hong Kong. No media was present. 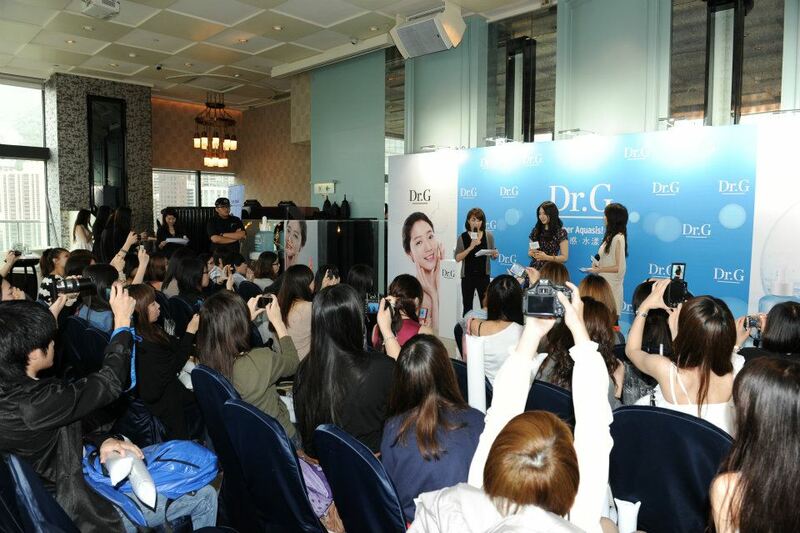 As mentioned before, 30 lucky fans who successfully applied on our site were chosen to attend. 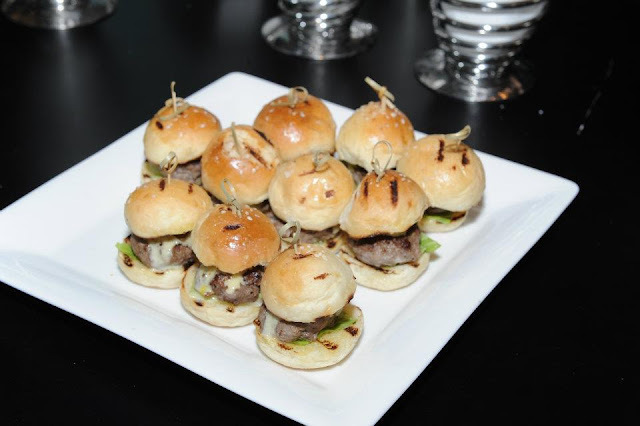 Refreshments were served throughout the event. 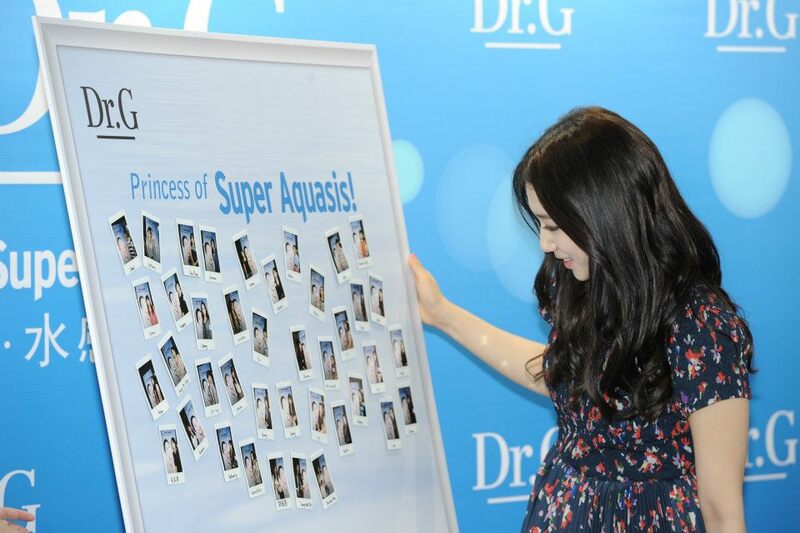 She greeted everyone and started to introduce the Dr.G Aquasis products. 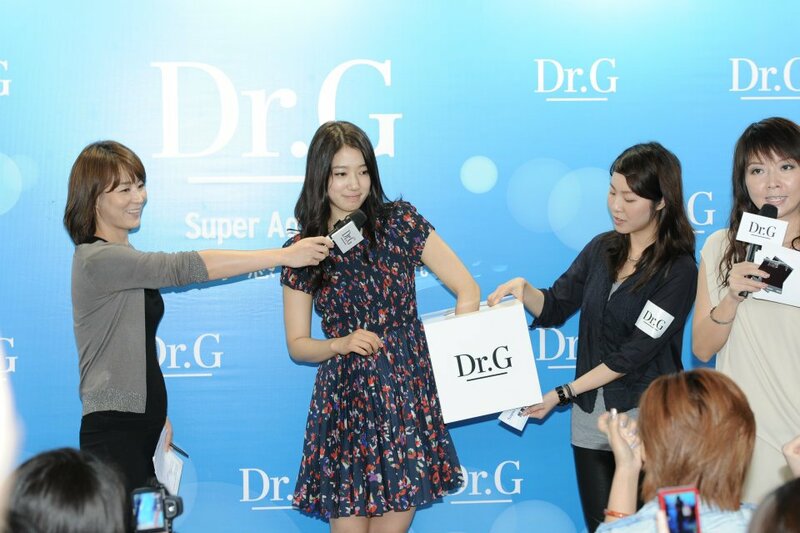 Once again, she was asked about her beauty tips for great skin and why she likes Dr.G products. Then it was time for live demos. 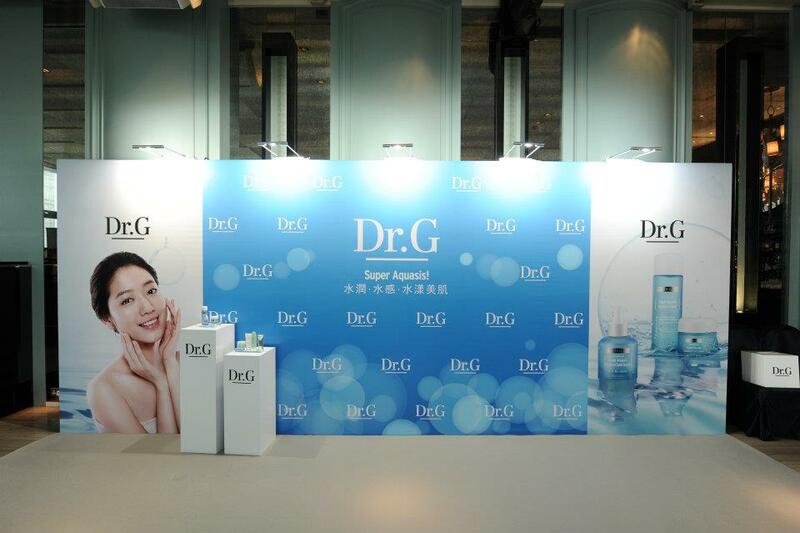 There were two live demos – one on BB Cream and one on the Aquasis Gel Cream. The MC said she would pick whoever that puts his/her hand up the fastest. I was very hesitant because I didn’t know whether.. and then I saw Shinhye staring at me and laughing. The MC told us to put up our hands again because she couldn’t see it clearly. So this time I shot up my hand at rocket speed and got chosen. 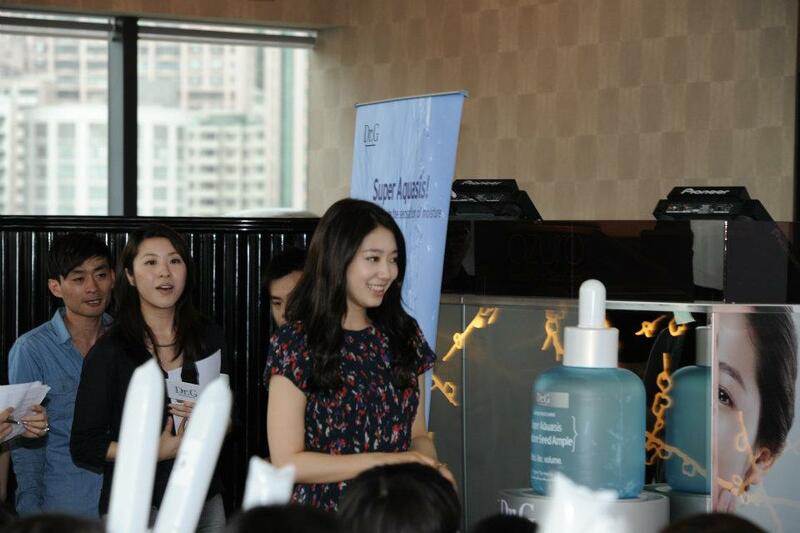 Shinhye started talking about the BB Cream and the usage of it. Then she squeezed a big amount of it onto her hand, dabbed it, spoke of how the product is good for summer use, and then dabbed some onto my hand. She was being her usual bubbly and cheeky self and said ‘kekekeke’ while she was dabbing it onto my hand. We both tried very hard to hold back laughter as to appear professional. Not quite successful haha. Then she spoke some more about the BB Cream and I was asked to speak about my feelings towards the product. 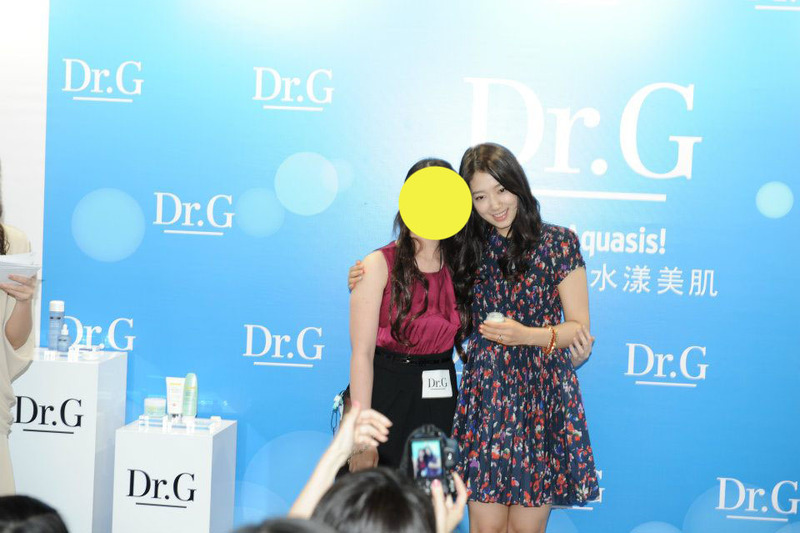 Then I was asked about how I felt to be able to stand so close to Shinhye. We almost broke out into laughter again on that one but I managed to answer hehe. Then I said thank you to Shinhye and returned to my seat. The next chosen person got to demo the gel cream with Shinhye. The third event was a lucky draw. 5 winners were chosen and were given traveling set products. Also, each of them received a little something brought from Korea by Shinhye – one person got Korean teddy keychains, one got a Minam mug.. etc. lucky! Among the winners, one of them was a fan who came specially from the Philippines to attend the event. When her name was picked, I said to Shinhye ‘This is your fan from the Philippines’ and Shinhye was surprised and happy “Philippine fan?”. Aww. The last event of the day was group photo taking. Note: Hong Kong people love taking group photos, which explains why both events today and yesterday had group photo sessions. After that, it was time for Shinhye to leave the venue for the airport. All the guests said ‘Kamsahamnida’ to her in Korean and she replied with ‘Dor Tse (Thank you in Hong Kong-nese)’ Then she waved goodbye and left. 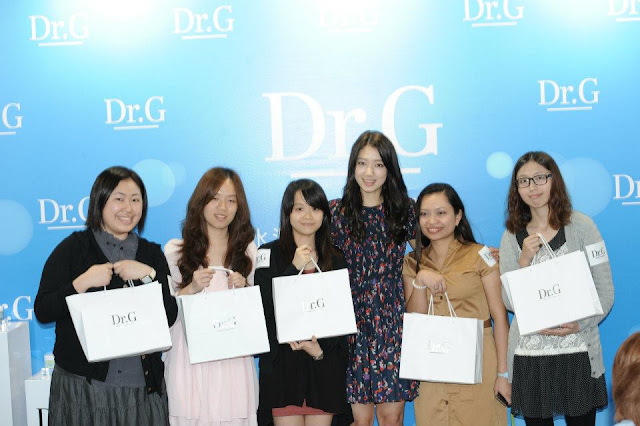 Upon exiting, each guest received a gift pack with sample Dr. G products and also a signed poster from Shinhye. We greeted her at the airport before she boarded her flight but no photos were taken to respect her privacy. Shinhye changed into her casual clothes, sports shoes and a cap. She waved goodbye to fans. 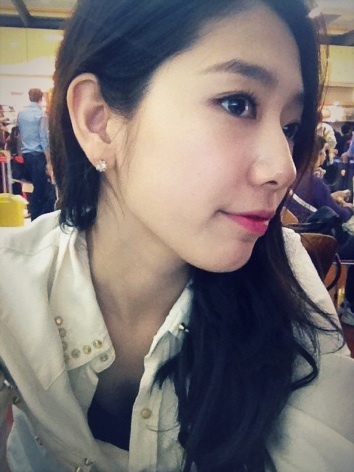 Inside the terminal, she updated her Twitter with two gorgeous selcas. I had a great time in Hong Kong and now it's tme to go home. See you next time Hong Kong~^^ Upon return to Seoul.......midterm exams are waiting for me... pout pout..ㅠ"
Glad someone won from the Philippines!!! Yahooooooooo!!!!!! Congratulations!!!!!!!!!! Karen thank you so much for all the time, effort, money and love you put into coordinating for these events. We know you're very busy with school but you placed this among the top of your list! we could not thank you enough for representing us! thank you for taking good care of Shin Hye during her time in Hongkong and giving her the warm welcome and send off. she's a very busy person like you and am sure she sees the love you've put in what you've done and appreciates it. ohhh! forgot to mention that! when i read that someone from the Philippines won i had goosebumps all over my arms! so happy for her!!! congratulations! so happy for you!!! maybe you can comment and share with us how you felt during the event and when you won. 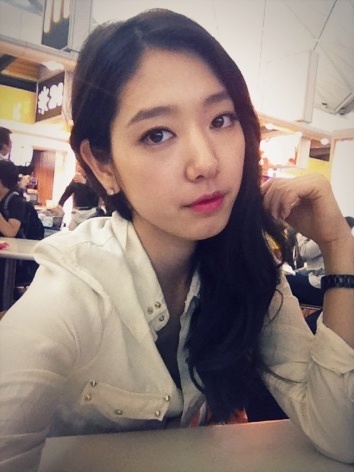 how was Shin Hye? Thank you Karen for all your efforts. You're an asset to Shin Hye and thank you for the good report. I hope that someday, you and Mee will be working together coordinating events like this - an event planner and coordinator. your patience is exemplary. 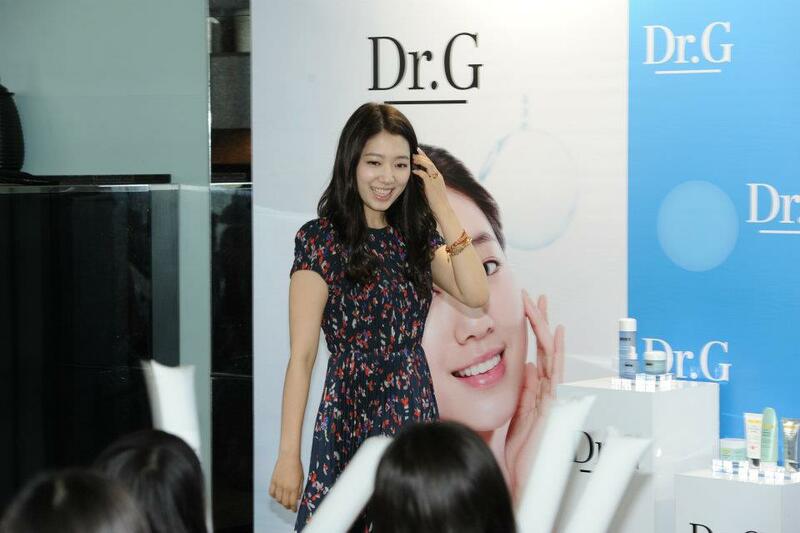 Shin Hye is indeed blessed to have fans like you Karen, Mee and the rest of the administrators of PSH_IFC. my heartfelt thanks for updating us. my friend and i would like to extend our sincere THANK YOU VERY MUCH to Karen for giving us the chance to be part of the event. our princess is really very sweet to her fans... i will continue to support her and hope to attend another fan meet with her. 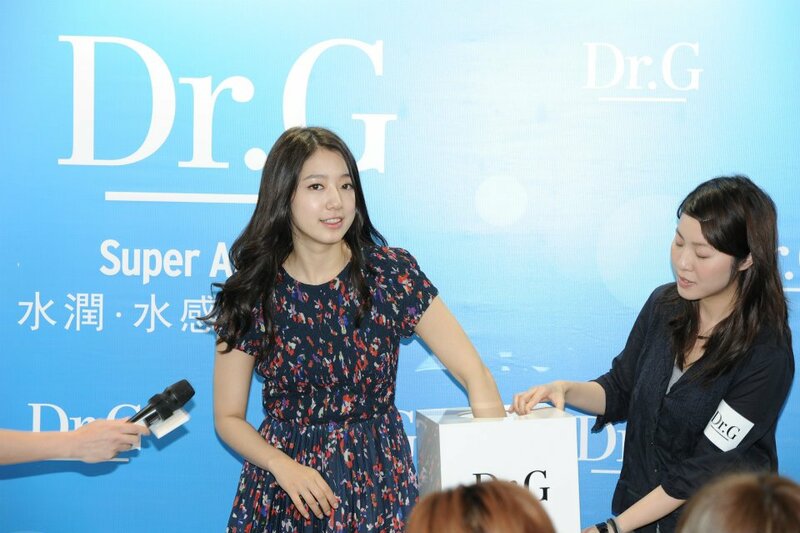 being there in the event with Shin Hye i was already very happy and won the draw made it more memorable..
hi! 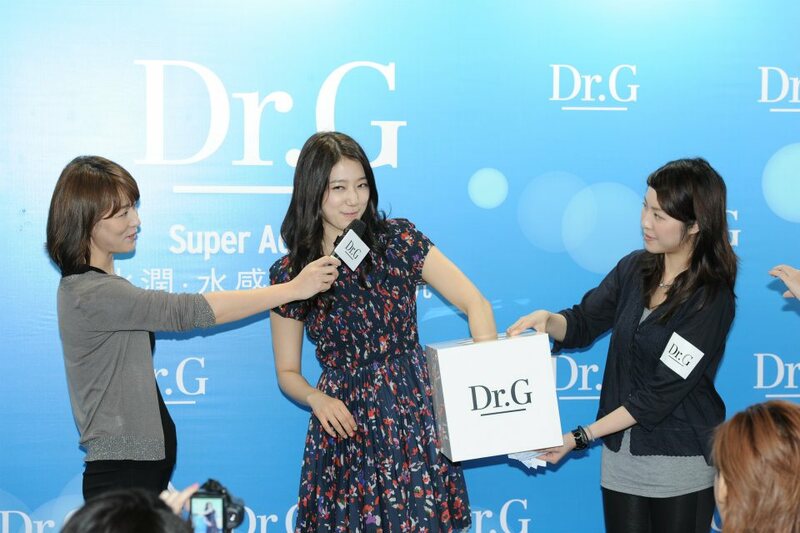 i know am being nosy, do forgive me for i cannot resist, but aside from the Dr. G travel kit what gift from Shin Hye did you get? and how long did the whole affair last? 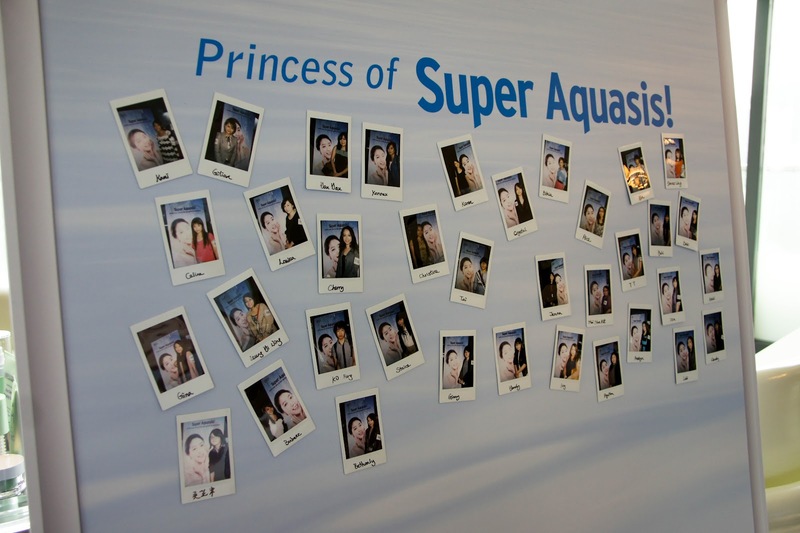 also we received the polaroid photos..thanks to PSHIFC for the great souvenir. actually i could not remember exactly the time duration of the event...hehehe sorry i was so star struck with Shin Hye... all i remember was we left the venue just few minutes after Shin Hye left...we left around 2.35pm +- because i still have to catch a 6pm flight and when we were saying our farewell with our new friends in PSHIFC, we found that Shin Hye will have a flight back to Korea around 5pm so she was also in hurry maybe coz the airport is somehow far from the venue. Thank you so much for sharing with us your story!!! You are so lucky and blessed! Did you Shin Hye some presents from Cebu? Dried mangoes? Hehe! Have some Korean friends and they love our dried mangoes. Am from Cebu too. Wish we can talk some day! Wish all Cebuano Starlight Angels can meet you! how to contact you vira?